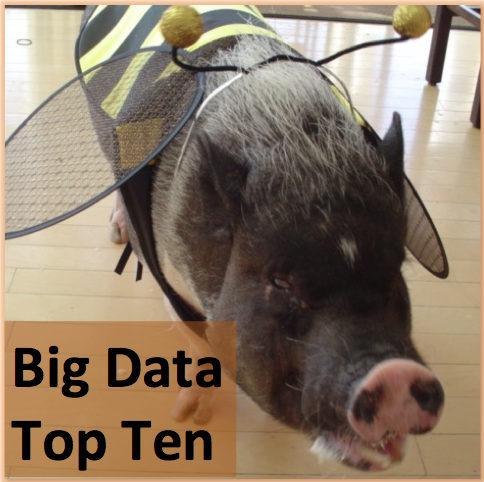 What do you get when you combine Big Data technologies….like Pig and Hive? A flying pig? No, you get a “Logical Data Warehouse”. In 2012, Infochimps (now CSC) leveraged its early use of stream processing, NoSQLs, and Hadoop to create a design pattern which combined real-time, ad-hoc, and batch analytics. This concept of combining the best-in-breed Big Data technologies will continue to advance across the industry until the entire legacy (and proprietary) data infrastructure stack will be replaced with a new (and open) one. As this is happening, I predict that the following 10 Big Data events will occur in 2014. A few projects have strong commercialization companies backing them. These are companies who have reached “critical mass”, including Datastax with Cassandra, 10gen with MongoDB, and Couchbase with CouchDB. Leading open source projects, like these, will pull further and further away from the pack of 150+ other NoSQLs, who are either fighting for the same value propositions (with a lot less traction) or solving small niche use-cases (and markets). The industry will begin standardizing on two distributions. Everyone else will become less relevant (It’s Intel vs. AMD. Lets not forget the other x86 vendors like IBM, UMC, NEC, NexGen, National, Cyrix, IDT, Rise, and Transmeta). If you are a Hadoop vendor, you’re either the Intel or AMD. Otherwise, you better be acquired or get out of the business by end of 2014. Because the open source, scale-out, commodity approach to Big Data is fundamental to the new breed of Big Data technologies, open source now becomes a clear antithesis of the proprietary, scale-up, our-hardware-only, take-it-or-leave-it solutions. Unfortunately, the promises of international expansion, improved traction from sales force expansion, new products and alliances, will all fall on deaf ears of Wall Street analysts. Time to short the platform RDBMS and Enterprise Data Warehouse stocks. Many claimed that 2013 was the “year of Big Data in the Cloud”. However, what really happened is that the Global 2000 immediately began their bare metal projects under tight control. Now that those projects are underway, 2014 will exhibit the next phase of Big Data on virtualized platforms. Open source projects like Serengeti for VSphere; Savanna for OpenStack; Ironfan for AWS, OpenStack, and VMware combined, or venture-backed and proprietary solutions like Bluedata will enable virtualized Big Data private clouds. Enterprises become savvy to the new reference architecture of combined legacy and new generation IT data infrastructure. Now it’s time to develop a new generation of applications that take advantage of both to solve business problems. System Integrators will shift resources, hire data scientists, and guide enterprises in their development of data-driven applications. This, of course, realizes the concepts like the 360 degree view, Internet of things, and marketing to one. Having a “Google-like” interface that allows users to explore structured and unstructured data with little formal training is the where the new generation is going. Just look at Splunk for searching machine data. Imagine a marketer being able to simply “Google Search” for insights on their customers? The days of ETL in its pure form are numbered. It’s either ‘E’, then ‘L’, then ‘T’ with Hadoop, or it’s EAL (extract, apply analytics, and load) with new real-time stream-processing frameworks. Now that high-speed social data streams are the norm, so are processing frameworks that combine streaming data with micro-batch and batch data, performing complex processors on that data and feeding applications in sub-second response times. After descriptive and predictive, comes prescriptive. Prescriptive analytics automatically synthesizes big data, multiple disciplines of mathematical sciences and computational sciences, and business rules, to make predictions and then suggests decision options to take advantage of the predictions. We will begin seeing powerful use-cases of this in 2014. Business users want to be recommended specific courses of action and to be shown the likely outcome of each decision. With Big Data, master data management will now cover both internal data that the organization has been managing over years (like customer, product and supplier data) as well as Big Data that is flowing into the organization from external sources (like social media, third party data, web-log data) and from internal data sources (such as unstructured content in documents and email). MDM will support polyglot persistence. Peter Sondergaard, Gartner’s senior vice president of research, will say that when it comes to big data and security that “You should anticipate events and headlines that continuously raise public awareness and create fear.” I’m not dismissing the fact that with MORE data comes more responsibilities, and perhaps liabilities, for those that harbor the data. However, in terms of the infrastructure security itself, I believe 2014 will end with a clear understanding of how to apply those familiar best-practicies to your new Big Data platform including trusted Kerberos, LDAP integration, Active Directory integration, encryption, and overall policy administration. Tagged with analytic application, CEP, cloud, ETL, hadoop, logical data warehouse, MDM, nosql, open source, prescriptive analytics, real-time, search, security, stream processing.